The idea of a media-savvy Presidency began with Kennedy — the first “Television President.” Then there was Reagan, someone trained for decades in television. Now there is Trump, a veteran creator of television. This is not a laughing matter. Television lives and dies on narrative. There has never been a politician with this deep of an intuition for narrative. There is a reason he has bamboozled the political establishment. Don’t look to the standard political pundits for insight, their record on Trump is a mess at this point. His strength is clearly revealed by The Narrative Index. Beware. IF YOU THINK STORYTELLING AND NARRATIVE ARE THE SAME, I’ve got a book to sell you. 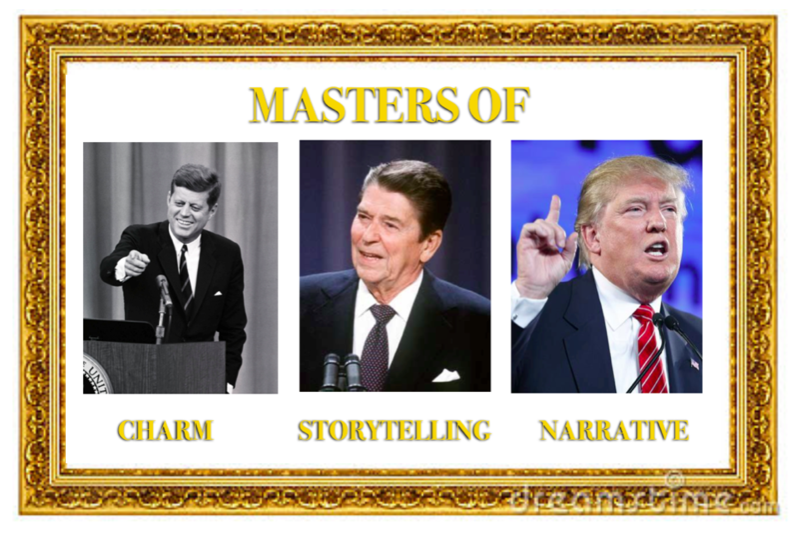 I’ve been following Trump’s performances for nearly a year using The Narrative Index which I laid out in the previous two blogs. At first I thought his high values were curious. Now I find them alarming. There has never been a politician like Trump. Lots of political pundits are now trying to say this, but the problem is they are inarticulate, non-analytical, and just plain simplistic (NOT the same as simple) in their assessments. They analyze his speech and use of language, but fail to come up with anything more sophisticated than the idea that he talks on the level of a 3rd grader (Politico), a 4th grader (Newsweek), a 5th grader (NY Daily News), or uses lots of “us” and “they” pronouns (NY Times). Gee, way to bring out the heavy guns of analysis. NONE of the shallow, silly analyses are worth reading nor have sustained any useful lines of thought. But narrative is different. It is the core of human culture. It goes back at least 4,000 years. It is the essence of how we communicate. So let’s begin with one important point. This is the simplest way to convey the distinction between these two terms. Storytelling and narrative are not the same. Reagan, who came to be adored as “The Great Communicator,” was beloved for his storytelling skills. But in contrast, nobody has ever loved a story told by Trump. He’s not a good storyteller. His stories are choppy, not much fun, and waste little time in getting to the point (which is what he lives for). Yet Trump is a master of narrative. How could this be? Aren’t storytelling and narrative the same thing? No. In my book I offered up the simple definition of narrative as, “The series of events that occur in the search for a solution to a problem.” That’s it. That’s what the narrative dynamic is about. Narrative is the driving force at the core of a story. All good stories are built around the search for the solution to a problem. Whether it’s figuring out the murderer, finding your way home, or defeating a threat, it is all about problem/solution. But a story involves many more elements wrapped around the narrative core. Reagan was a storyteller. He knew how to present stories with all their warmth, humor and emotion. His stories were always about problems. Trump doesn’t give much of a crap about the warmth, humor or emotion. He’s mostly just about problem-solution, over and over again, all day long. You hear narrative structure in almost everything he says, and it manifests itself in part through the use of the word “but.” It’s not the only important narrative word, but as I explained in the earlier posts, it’s the most common. Trump uses it more than any other politician. Ever. There have been nine Republican debates so far. 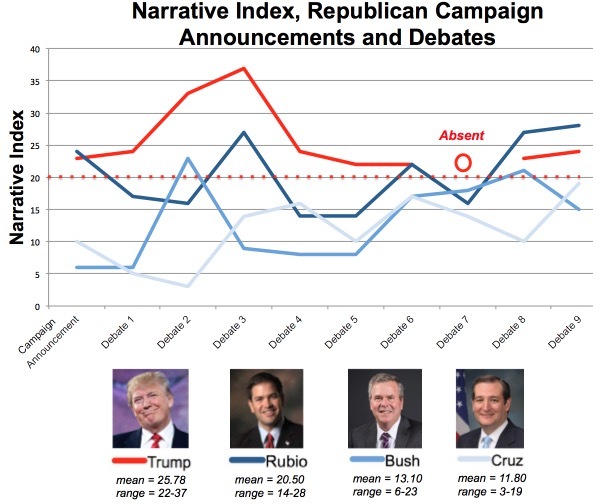 Trump has scored a Narrative Index above 20 for every performance. No one else has done this. Same thing for all his speeches. Same thing for all his press conferences. I’ve analyzed a total of 23 performances. Not just always above 20, he’s scored as high as 58 in his June 28 interview with Jake Tapper. The man breathes narrative structure. Of course he doesn’t own the network, but I’ve watched in disbelief since last summer as MSNBC has literally given over their network to him. Has anyone spoken out about this? Trump brags of all the free media exposure he scores. I thought MSNBC is left leaning. And yet, since last summer, night after night they have literally pre-empted their programming to cover just about every speech or press conference Trump has given. They haven’t done this for ANY other candidate. Not even close. Not Hillary, not Bernie — not a one of them. Why? The simple, non-quantitative answer is that “Trump is entertainment.” What does this mean? That he is funny? He’s not really that funny — not like a stand up comic, or any funnier than several other candidates. Is it that he’s crude and outlandish? There have been plenty of crude and outlandish politicians in the past. None have ever earned free air time by the hour. The simple answer is that Trump delivers “concision.” He is physically constructed for the medium of television. He speaks in closed loops that have narrative structure. Yes, he repeats the same stuff, but so what. It’s about the smaller scale dynamic of each narrative loop. He starts a loop (addressing a problem), gets quickly to the “but” then quickly to the “therefore.” This is what I’ve been talking about with the Narrative Index. He has deep narrative intuition. And this is what television doesn’t just seek — it demands. I don’t have the time and resources for massive data analysis. Hopefully someone else does. It would be nice to have a larger sample size than this. But look at the pattern for the N.I. for three PBS documentary shows plus “Cosmos.” I analyzed 4 of each and all 13 episodes of “Cosmos.” All of them average over 20 for their N.I. More data are needed to say it with complete confidence, but I’d be willing to bet there is a functional “narrative threshold” to television programming which is probably about 20. TV just has no tolerance for “and, and, and” drivel. Nor does Trump. PRE-ADAPTED TO THE TV LANDSCAPE. 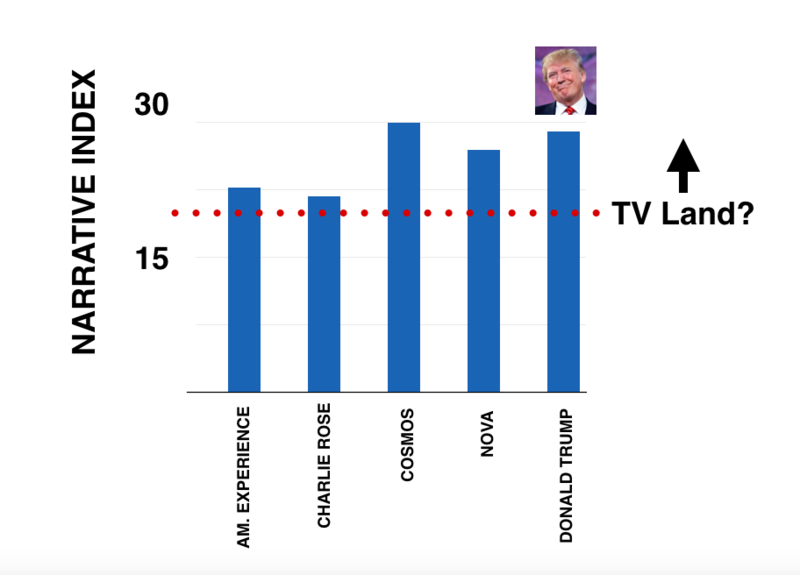 Trump’s average Narrative Index of 28 matches what television demands. He is truly the candidate for today’s media-driven society. No other candidate is close. What do we mean by staying on narrative? It means stating your narrative theme at the start of your journey (“To Make America Great Again”). Repeating it endlessly throughout the journey. Then eventually coming full circle by achieving it, which is his dream. He is the only one with this clearly defined narrative dynamic. As I explained in the first of these three blogposts, the Narrative Index is very simple to calculate. Just copy, paste, count and divide. You should put it to work with lots of stuff. Think of any text in the world. How much narrative strength does it have? You definitely need over 1,000 words, and I’d still be cautious until you’re getting closer to 10,000 words. But when you’re past 50,000 words the patterns appear pretty robust — as was the case for the Lincoln-Douglas debates. FUN WITH THE NARRATIVE INDEX! One immediate application is my friend Bill Dennison who has applied it to the works of the co-discoverers of The Theory of Evolution By Means of Natural Selection, Charles Darwin and Alfred Russell Wallace. He just posted his very nice essay using the N.I. which provides at least one explanation of why one man became famous for eternity while the other largely vanished. You can also put it to work with literary texts. Remember last year when literary experts were debating whether the new novel from Harper Lee, “Go Set A Watchman,” might simply be an early draft of her masterpiece, “To Kill A Mockingbird”? If you go with the assumption that the revision process for a story involves in part a variation of The Rule of Replacing (replacing “ands” with “buts”) then you would predict Watchman would be more of an AAA work while Mockingbird is more ABT. The Narrative Index matches this prediction.Watchman scores an N.I. of 17 while Mockingbird scores a 24. It’s not the definitive proof, but is at least quantitative and in the case of these novels the sample size of total words is pretty large. From the start of the current Presidential campaign, Hillary has lacked the basic narrative elements that Trump has a mastery of. She never developed a simple, singular slogan. Even Bernie managed it with his “eat the rich” theme. When quizzed on Bernie’s approach to Wall Street she takes the AAA approach of “it’s not that simple.” She doesn’t drill into problem-solution dynamics the way Trump does, and now, most distressing, the numbers are stark for The Narrative Index. Trump is never below 20 in the more than 20 performances of his I have analyzed. She ends up with an average of 14 (for 21 performances) with 6 of the scores being below 10, and only 5 over 20. In simple terms, she delivers half the narrative heft of Trump. So what does this mean? It’s pretty simple. Do the math. She needs to get more focused, even at the finest scales of how she communicates. It’s a short attention span world today. Trump is pre-adapted to it. Hillary is communicating like the 90’s. But here’s one glimmer of hope. The highest score I’ve ever found for her was a 27, which is right at Trump’s level. Guess where it was from. Her Wellesley College student commencement speech of 1969.